We offer a comprehensive watch maintenance service. All watch service and repair work is guaranteed for 12 months. There is no charge for repair quote and examination. We are able to liaise with the appropriate watchmakers from Switzerland, New Zealand and Australia who are qualified to carry out the appropriate work and obtain the necessary original replacement parts. We can also advise you of the necessary procedure to send your watch directly to the factory in Switzerland. 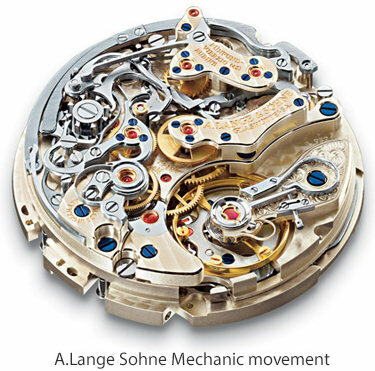 A mechanical watch movement is a finely tuned precision instrument with many moving parts and could be likened to a car engine. Much like an engine in a car it requires lubrication to keep all the various parts working efficiently and to reduce wear on the various parts of the mechanism. To ensure the watch is performing at its optimum level of accuracy the watch movement should be serviced every four or five years. This process requires the various parts of the movement to be dismantled and cleaned. It may also be necessary to replace some of the worn or damaged movement parts and the rubber seals on the case back and winding crown to ensure that it is water and dust resistant. The mechanism is then lubricated and reassembled. In addition to this the watch case and bracelet can be re polished and refinished (as an optional extra) to remove surface scuff marks and scratches and return the watch appearance back to as close to possible to the original new condition. 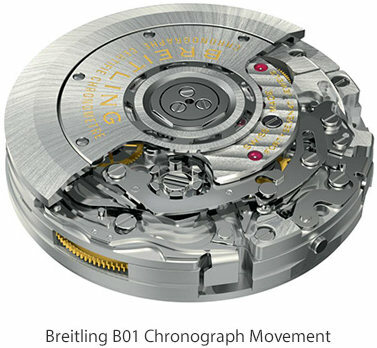 Once this is done and the movement and watch are reassembled, the timing is checked and adjusted to ensure that it is performing as accurately as possible over a variety of positions (to simulate the positions on the wearers wrist). If the watch has a quartz (battery) powered movement the battery will need to be replaced every 2-3 years and the mechanical part of the movement may also need to be serviced from time to time. As the movement has electronic components the circuit on the movement can fail over time and this may also need to be replaced. It is advisable to have the battery replaced every few years as deteriorating batteries (if left in the watch too long) can leak and the leaking oxides can cause severe damage to the movement. A quartz watch is a watch that uses an electronic oscillator that is regulated by a quartz crystal to keep time. This crystal oscillator creates a signal with very precise frequency, so that quartz watches are at least an order of magnitude more accurate than mechanical watches. Generally, some form of digital logic counts the cycles of this signal and provides a numeric time display, usually in units of hours, minutes, and seconds. The first quartz clock was built in 1927 by Warren Marrison and J.W. Horton at Bell Telephone Laboratories. Since the 1980s, when the advent of solid state digital electronics allowed them to be made compact and inexpensive, quartz timekeepers have become the world's most widely-used timekeeping technology, used in most watches and clocks. A mechanical watch is a watch that uses a mechanical mechanism to measure the passage of time, as opposed to modern quartz watches which function electronically. It is driven by a spring (called a mainspring) which must be wound periodically. Its force is transmitted through a series of gears to power the balance wheel, a weighted wheel which oscillates back and forth at a constant rate. A device called an escapement releases the watch's wheels to move forward a small amount with each swing of the balance wheel, moving the watch's hands forward at a constant rate. 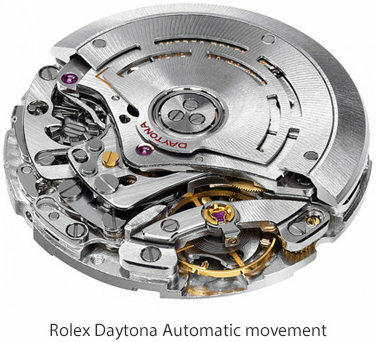 This makes the 'ticking' sound characteristic of all mechanical watches. Mechanical watches evolved in Europe in the 17th century from spring powered clocks, which appeared in the 15th century. Mechanical watches are not as accurate as modern quartz watches and are generally more expensive. They are now worn more for their aesthetic attributes, as a piece of jewellery and as a statement of one's personal style, than for their timekeeping ability. An automatic or self-winding watch is a mechanical watch in which the mainspring is wound automatically as a result of natural motion of the wearer's arm, to provide energy to run the watch, making manual winding unnecessary. A mechanical watch which is neither self-winding nor electrically driven may be called a manual watch. Many of the mechanical watches sold today are self-winding. A mechanical watch is powered by an internal spiral mainspring which turns the gears that move the hands. The spring loses energy as the watch runs, so in a manual watch movement the spring must be wound by turning a small knob on the case, the crown, to provide energy to run the watch. Otherwise, once the watch loses its stored energy, it stops. The fully wound mainspring in a typical watch can store enough energy reserve for roughly two days, allowing the watch to keep running through the night while stationary. In many cases automatic watches can also be wound manually by turning the crown, so the watch can be kept running when not worn, or when the wearer's wrist motions are not sufficient to keep it wound automatically. A chronograph is a specific type of watch that is used as a stopwatch combined with a display watch. A basic chronograph has an independent sweep second hand; it can be started, stopped, and returned to zero by successive pressure on the stem. Nicolas Mathieu Rieussec invented the chronograph in 1821. There are two main types of chronographs, the automatic chronograph and the digital chronograph. The difference between the two is that the automatic chronograph depends solely on kinetic energy as its power source, while the digital chronograph is much like the common stopwatch and uses a battery to gain power. The first automatic chronograph was invented and patented by the Swiss watch manufacturer now known as Tag Heuer in 1969. 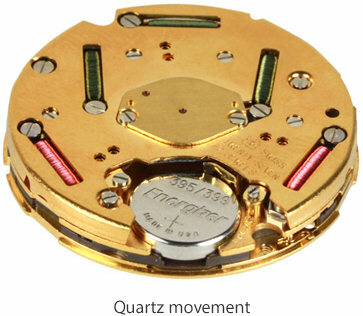 This watch was the first one ever to be equipped with an automatic movement system. Later other watches from the same series — the Carrera Calibre was produced with an automatic chronograph. A few years later brands like Rolex and Omega also patented their own automatic chronograph systems. JewelWatch provide a polishing and refinishing services for your watch. Our polishers are trained in the art of polishing. Using only the very finest polishing tools and equipment, and in strict accordance with the techniques and quality standards issued by the watch manufacturer, our polishers will rejuvenate your watch to its original look. Charges from $140 to $295 depending on complexity of finish. If you want to exchange your watch or sell it outright there are two ways that we can do this. If your watch is one that we would like to buy outright, then we simply agree on a price (subject to inspection) a cheque is drawn made out to you for the agreed amount. The other option is to use the amount agreed upon for your watch as a credit towards the purchase of a new watch. If you do not wish to sell the watch outright then you can sell it for a commission on this web site. You can set the price you want and the watch will sell only if it reaches this value. The commission fee is 15%.